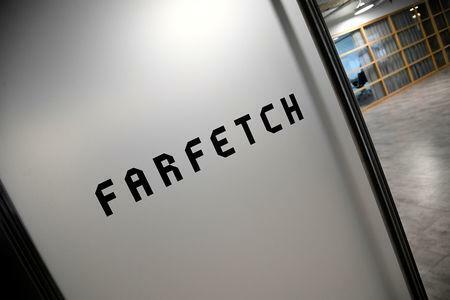 (Reuters) - Online fashion retailer Farfetch aims to float on the New York Stock Exchange by the end of the year, the London-based company said on Monday, seeking to capitalise on rapid growth in luxury sales on the web. Competition to capture online shoppers has picked up among premium brands in recent years, pitting conglomerates such as Louis Vuitton owner LVMH against independent operators as some scramble to make up for a slow move into e-commerce. Farfetch runs an online marketplace for luxury wares offered by nearly 1,000 brands and boutiques worldwide rather than hold stock itself. Online sales made up 9 percent of global luxury revenue in 2017 and are forecast by consultancy Bain to reach a quarter of all sales by 2025. "This industry is still in its infancy," Farfetch founder Jose Neves said in the company's regulatory filing. Existing shareholders include China's JD.com, which invested $397 million in 2017, expanding Farfetch's foothold in the world's biggest market for luxury consumers. JD.com has agreed to buy more shares to maintain its stake after the listing, Farfetch said without disclosing the size of the holding. Other investors include publisher Conde Nast and DST Global, run by Silicon Valley-based billionaire Yuri Milner, who had once backed Facebook and online home rental company Airbnb. Farfetch, which competes with platforms including MyTheresa and MatchesFashion, has also expanded into technology, working with France's Chanel to link its stores to digital services such as chatrooms. It has also paired up with Britain's Burberry to help the fashion brand make its inventory more widely available online. Other companies have been investing in their own e-commerce ventures, including Cartier parent Richemont, which took control of Farfetch rival Yoox Net-A-Porter this year. Farfetch's revenue grew by 59 percent to $386 million in 2017, its filing showed. However, losses deepened to $68 million in the first half of this year, from $29 million in the same period of 2017, as investments and costs increased. Proceeds from the initial public offering (IPO) will be used for working capital, including possible acquisitions, the company said. Goldman Sachs, JP Morgan, Allen & Co, UBS, Credit Suisse, Deutsche Bank, Wells Fargo, Cowen and BNP Paribas are the underwriters for the planned IPO.